For all the frustration that independent content producers such as myself are running into with multi-billion dollar media companies regarding YouTube and other self-publishing outlets, it's comforting to know that we are not the first... and no doubt won't be the last either. Putting it into perspective, Nate Anderson has composed a very good piece over at Ars Technica titled "100 years of Big Content fearing technology-in its own words". 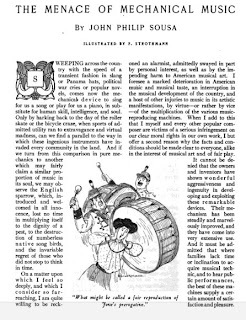 In it Anderson documents a century of hysteria on the part of copyright holders that in retrospect is absolutely laughable: everything from fears of the photocopier after World War II and how some dreaded the coming of the VCR, on back to John Philip Sousa's screed against player pianos and gramophones (pictured). It's only too interesting to note that in spite of all of the "warnings", that there has been no evidence at all that technology has stifled creativity... or that the copyright industry has done anything to encourage creativity, for that matter. Quite a rollickin' good read no matter where you're coming from.